One thing that’s always been distinguishable about me is my lack of roots. It’s not that I’m in any particular way a rootless person; it’s just that my life’s circumstances have been such that I haven’t really had the opportunity to settle down, or become attached to any place or person. I have no hometown, no childhood friends that I catch up with every year or so, no place to go back to. My mother and father both live many miles away from the area where I grew up and my brothers and sisters are scattered all over the country. I live a nomadic life, staying in a place for a year or two before moving on. At this point I’ve lived in more houses than there are years to my life! But throughout my life there have always been a few things that remained stable, anchors in what was sometimes a tumultuous sea of experience, and one of these anchors has been my grandmother. On many occasions I’ve returned to live with her after some adventure in my life ended or went a little more pear-shaped than I could handle. Because we share many of the same values and perspectives on life we have a wonderful relationship that is very enriching and her support and unconditional love has nourished me and made me the person I am today. Now she is 1000's of kilometers away from where I live. Letting go of her is perhaps the hardest lesson in surrender yet. Roots are different for everyone: they include family, childhood friends, cultural traditions and customs, a piece of land where one feels at home, learned ways of looking at the world. Many would argue that letting go of these things is not desirable, that roots are essential and beneficial to our wellbeing. 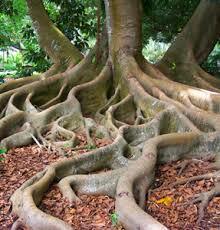 I agree that roots provide stability, a firm foundation. They are nourishing and grounding. But here we need to distinguish between enjoying and benefiting from our roots and needing them, which is where attachment comes in. If we ask ourselves ‘what would happen if I didn’t have that person/place/idea/thing in my life?’ the answer should be ‘I’d be okay.’ You can be happy and creative, free to go with the flow of life, either with or without that connection. Your roots feel inhibiting. They hold you back from following the natural flow of synchronicity in your life, from taking up the opportunities that come your way and from using your gifts. You are like a pot-bound plant that needs more space in order to grow. You feel great about your roots. They provide the foundation on which you’re able to be creative, to explore and to grow. However when those roots aren’t there you fall down. You can’t seem to be happy and at peace without them. The first situation is not so relevant to me, as my family is supportive and encouraging of my choices, never judgemental or clingy or manipulative. But for many people family roots equate to disapproval, guilt, secrets, game playing and other unhealthy attachment-based behaviour. In these cases letting go of one’s roots can be very freeing. In my case I have learned very well to do without roots and the freedom this has allowed me has enhanced my creativity, my courage and my growth as a human being. But still I feel a great fear in my heart when I think of my grandmother’s passing. It’s as if the constancy of her presence has allowed me to explore so boldly, knowing that if anything were to go wrong I could return to her, that if I became lost she would always be the reference point by which I could reorientate myself. I suppose that letting go of my dependence on her for this sense of security will push me to find my own inner anchor point, my inner roots. So that in dark times I may find light within, in times of tumult, peace, in times of confusion, clarity. To do I must remain aware of the petty day-to-day attachments that divert my attention, pull me away from my centre and stifle my freedom of expression. Meditation remains the best tool I know of to achieve this clarity: as I sit, allowing my thoughts to pass by without my mind grasping onto them, I learn to let go of the frustrations, the fixations, the passions that occur in my daily life. Once you’ve found your inner roots you can begin to nurture them, tending them with care and attention, watering them with love, so that they grow deeper and stronger, providing a stability that is far more real than any security you might find in the outside world. Such outer security is subject to change: the lover dies, the house burns down, the business fails and where are you left? Letting go of our need for roots allows us to become strong, to act with freedom and to grow into the highest expression of ourselves.